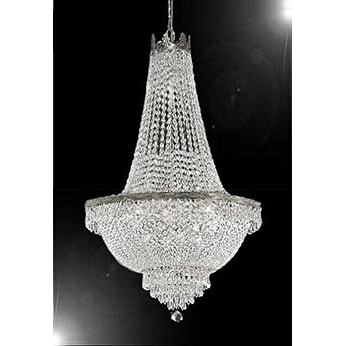 "This beautiful Chandelier is trimmed with Empress Crystal(TM) CRYSTAL CHANDELIER, this chandelier is characteristic of the grand chandeliers which decorated the finest Chateaux and Palaces across Europe and reflects a time of class and elegance which is sure to lend a special atmosphere in every home. SIZE W 24"" X H 50"" 9 LIGHTS Assembly Required. Comes with 18 inches of chain and wire Lightbulbs not included. Please note, when you purchase an item from the Gallery you can be assured of the ""Gallery 4 Points of Confidence"": 1. Each item comes with a Certificate of Authenticity, certifying this product is an authentic Gallery lighting fixture. 2. Each item comes with a Gallery backed warranty (Established 1978). 3. Each item will include Gallery verified and approved diagram and instructions. 4. Each purchase is provided with a toll free number for free Gallery tech support. Requires (9) 40 Watt candelabra base bulbs (E12) - not included. Not UL. Dimensions 24.0 In. X 24.0 In. X 50.0 In.